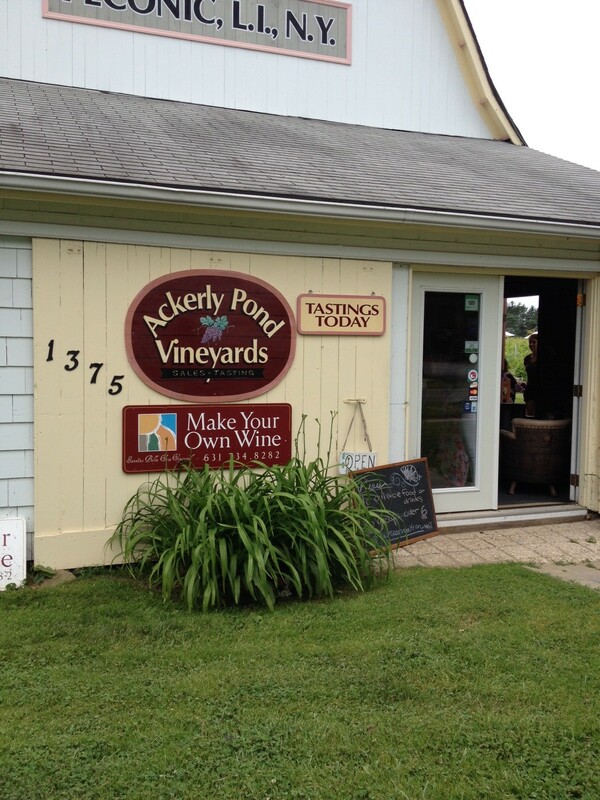 This used to be the Ackerly Pond Vineyard, and, though none of the wines are labeled Ackerly, the sign is still there. The sign outside Sannino Bella Vita says no groups of over six without a reservation, and that’s a good idea, because this small venue really can’t handle a big influx, as we saw when a group with a Groupon and another group there for Anthony Sannino’s wine tour arrived at the same time. 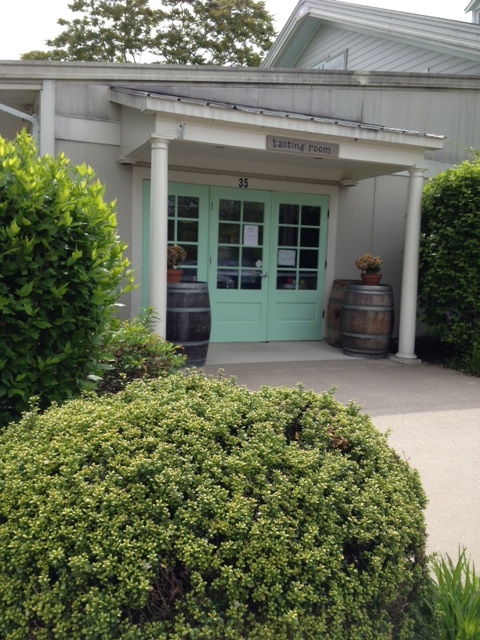 However, the cheerful and hard-working tasting room staff did their best to compensate, and we were in no hurry anyway. Our youthful server was new to the winery, and actually learned a few facts from us, but she was so charming we didn’t mind at all. Anthony Sannino off to give a tour. 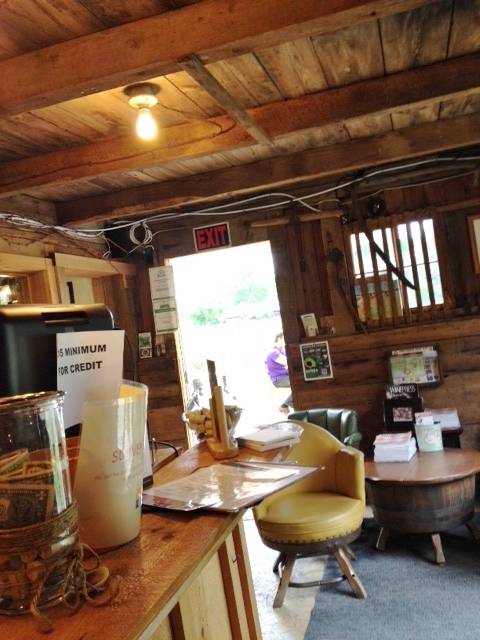 This is a great spot if you hope to interact with an owner, as Anthony Sannino is usually on site. In addition, for a small winery they have an interesting range of choices, with a menu of eleven different wines to choose from for a tasting. Since their standard tasting is six wines for $18, we decided to share two tastings, thus getting to sample all the wines (except one that is off the menu). They generally set up all of your tastes on a tray, but with the influx of the groups they asked if we would mind getting our tastes one at a time, since they were worried they would run out of glasses! No problem. We also could have ordered a cheese and meat tray for $18. We opted to sit on stools at the bar, but most other people sat outside on the side patio. The room has, according to one of the servers, “a certain rustic charm,” and we agree. 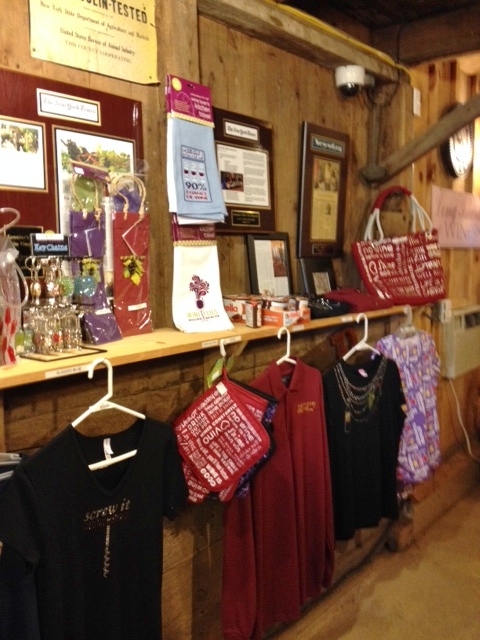 There’s also a small selection of amusing wine-related gifts, and the Sanninos run a B and B next door to the winery. They are just down the street from Greenport Harbor Brewery’s Peconic location, where mass quantities of people were flocking for a barbeque cook off. We decided to give it a miss. There’s an interesting vegetable aroma which we note in several other of their wines. Maybe asparagus? Also a touch of baked pear, even though this is a steel-fermented chard. The taste is a touch sweet for a steel chard, but ends with a tart lemony flavor. Nice, and quite buyable. 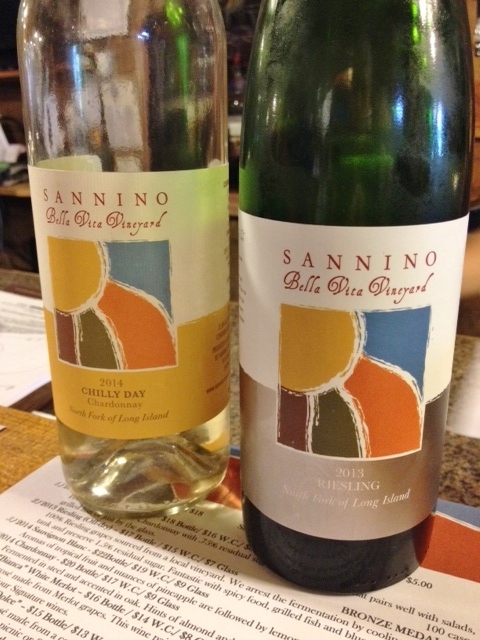 We also note that the whites are served at a good temperature—not too cold. “Bronze Medal in the FLI,” says the menu, which we later learn stands for Finger Lakes International. We’re somewhat iffy on rieslings, but this one is quite nice, with green plum aromas and tastes, plus a touch of citrus. It’s not too sweet, and would be a nice chilled summer sipper or an accompaniment to Thai food. “I’d definitely have this with oysters,” I say. Lots of not-overly-ripe pineapple taste, tart, lemon at end, with a touch of cabbage in the aroma. Also worth buying, I think. The menu says this is “fermented in steel and accented in oak,” and though at the moment there was no one to tell us exactly what this meant, we can figure it out, as this is an only lightly oaked chard. We smell honey and almond butter, but the taste is dry and crisp. If you find steel chards a bit too crisp and oaked chards too buttery, you’d probably like this one. This is a rosé, of course, so, as always, we compare it to Croteaux. 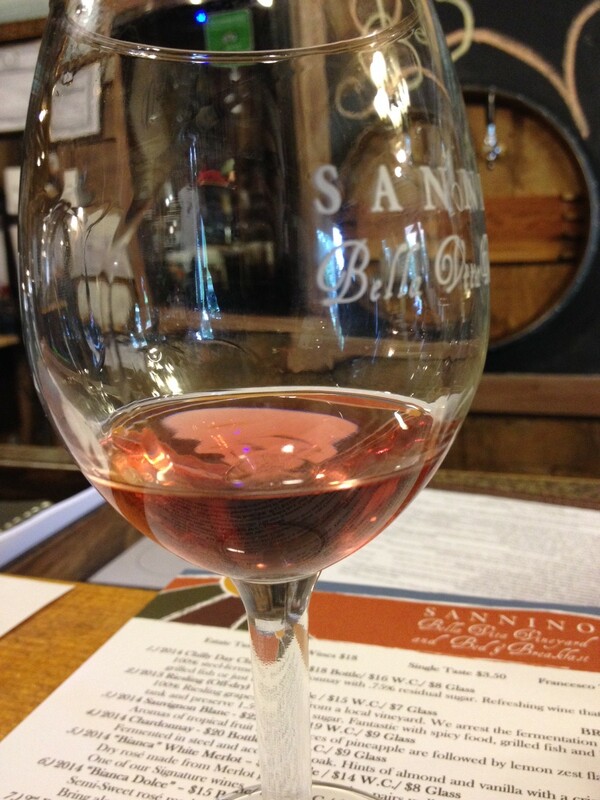 The color is a pretty dark pink, with sweet strawberry aromas with again a touch of that vegetable scent. It’s good, though sweeter than Croteaux’s 314, and with less going on. Our server confidently informs us that this is their sweetest wine, and notes that “people come in just for it.” I get that. This has a lighter color than the Bianca, and is quite sweet, almost enough to be a dessert wine. However, it is light and not cloying. Might be nice over ice. Why 2nd Bottle? Because this is a wine you serve second, because “nobody cares by the second bottle.” A non-vintage blend of varietals, this is a fine barbeque wine, with no depth and not a lot of fruit, but quite drinkable. Something in the aroma reminds me of a black olive tapenade, like the one we sampled earlier in the day at Vines and Branches in Greenport. 50% cabernet sauvignon, 33% cabernet franc, 17% merlot, we inform our eager-to-learn server, means this is a Left Bank Bordeaux-type blend. It’s also quite good, with aromas of coffee, cigars, and grape juice and lots of dark fruit tastes. This one is also aged for 22 months in French and Hungarian oak. Ooh, this wine won a Silver Medal in the FLI. The menu describes it as “elegant.” Well, there is something restrained about it. Quite dry, with a bit of a woody aroma, it would be okay with lamb, but we liked the Prima Rossa much better. 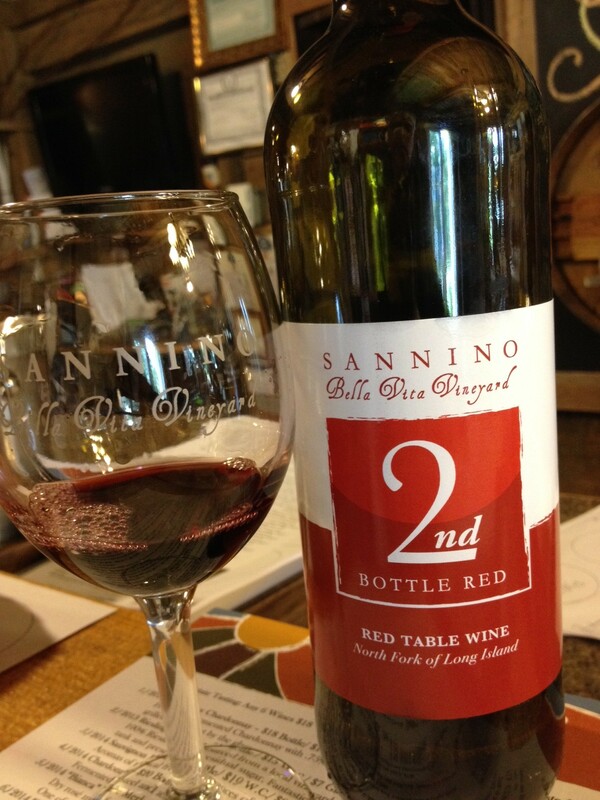 We opt to get two tastes of this one, to complete our twelve, and decide that was a good choice, as we like this the best of the reds. A blend of 85% petit verdot and 15% cabernet sauvignon, aged 22 months in French and Hungarian oak, this wine has lots of dark fruit aromas with just a touch of smoke, and tastes very good. Lots of fruit, maybe some jam—I could see this with the Crescent Farm duck breasts I served with a strawberry-rhubarb sauce last week. It certainly merited its Silver Medal in the FLI. 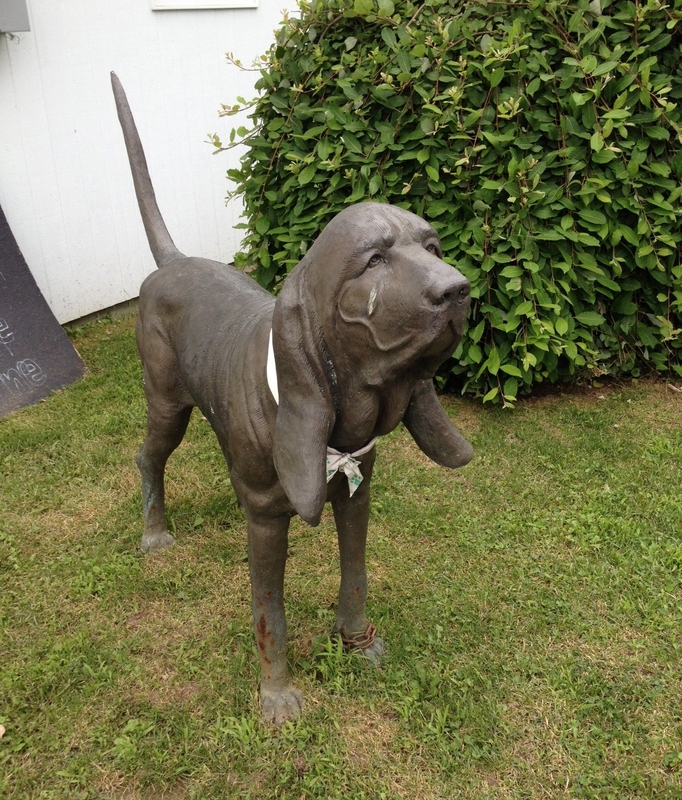 This serious-looking canine statue stands guard over the parking lot. Reasons to visit: you like an intimate setting, with the chance to chat with an owner (if he’s not giving a tour—or you could sign up for the tour! 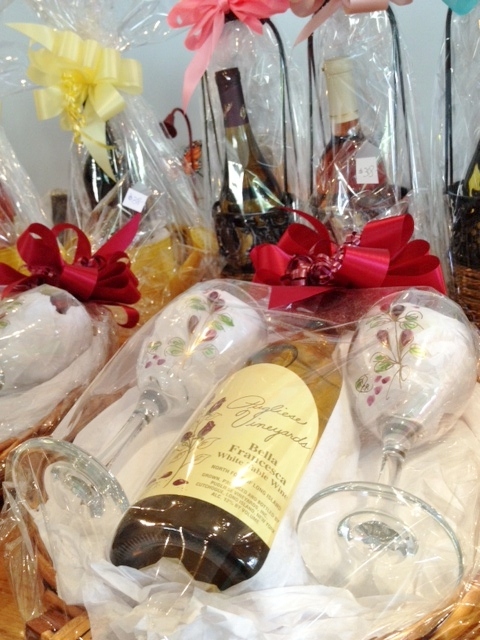 ); the Chilly Day Chardonnay, the Sauvignon Blanc, the Prima Rossa, the Spotlight Petit Verdot; a cute selection of gifts. The vines are in full leaf now. 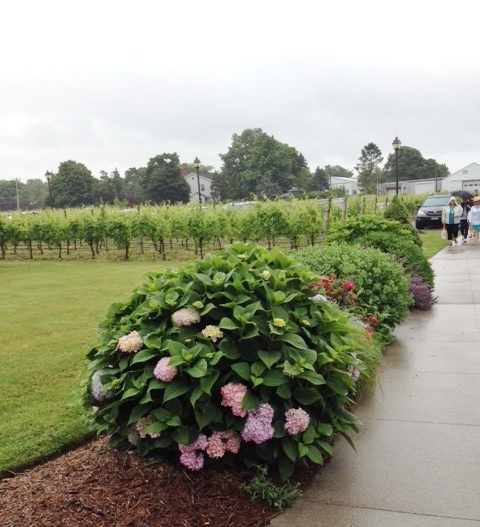 A visit to a winery is a great way to brighten a rainy day. 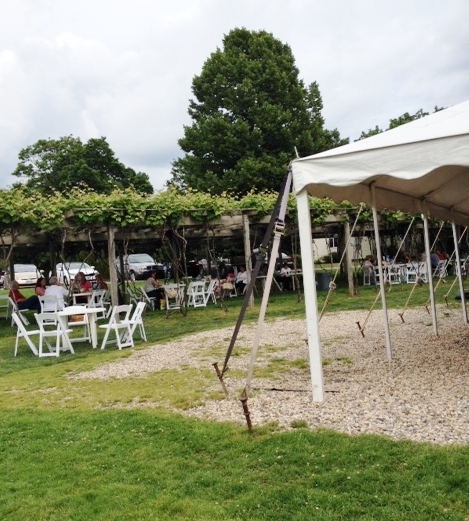 We braved the crowds that had come to the North Fork for the Mattituck Strawberry Festival and the rain that had arrived that afternoon for an excursion to Clovis Point Wines. Now, if you Google Clovis point you will find yourself looking at arrowheads, and wondering what the connection is. 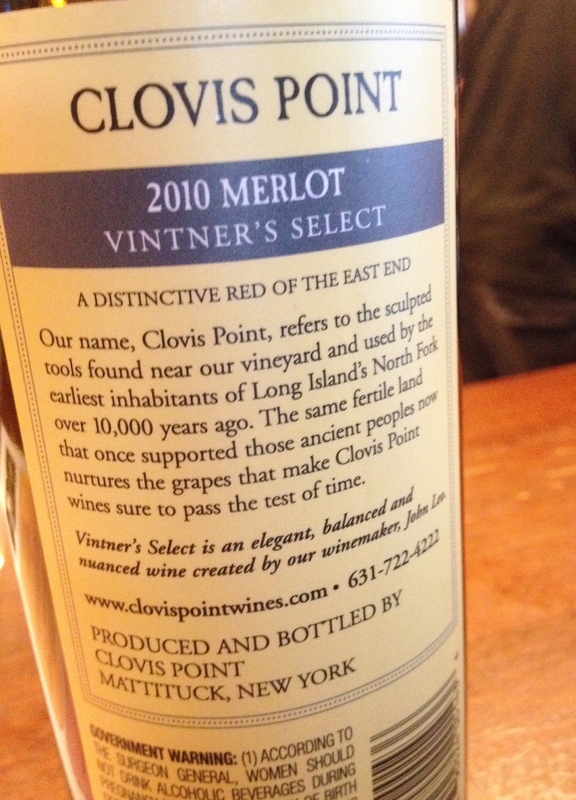 In fact, Clovis point does refer to a type of arrowhead, examples of which have been found on the North Fork, hence the name. 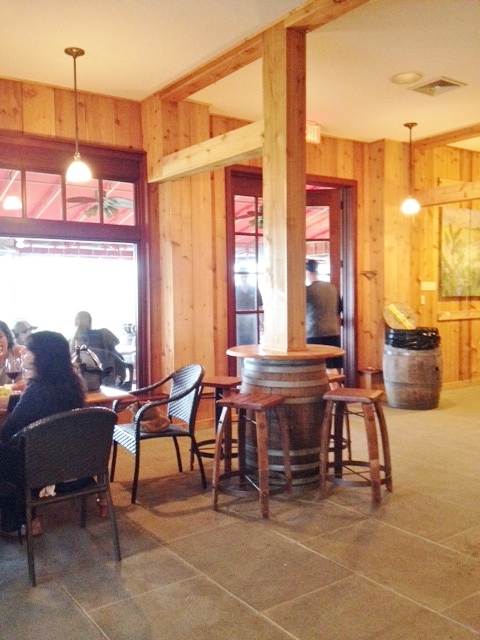 The winery nods to the past of the area in another way, housing its tasting room in a converted potato barn, but the wines are thoroughly modern. The servers alternated between quite friendly and enthusiastic and rather pleasant but business-like. The bar area was fairly quiet because all the action was outside on the covered porch, where a country and western band was entertaining tables full of people sipping wine and eating snacks, some bought from the winery (a menu features cheeses, sausage, and other small snacks for about $10) and others brought in. (A sign permits outside food, but requests “no coolers.”) Once before we had come especially for a musical performance, which we had enjoyed. 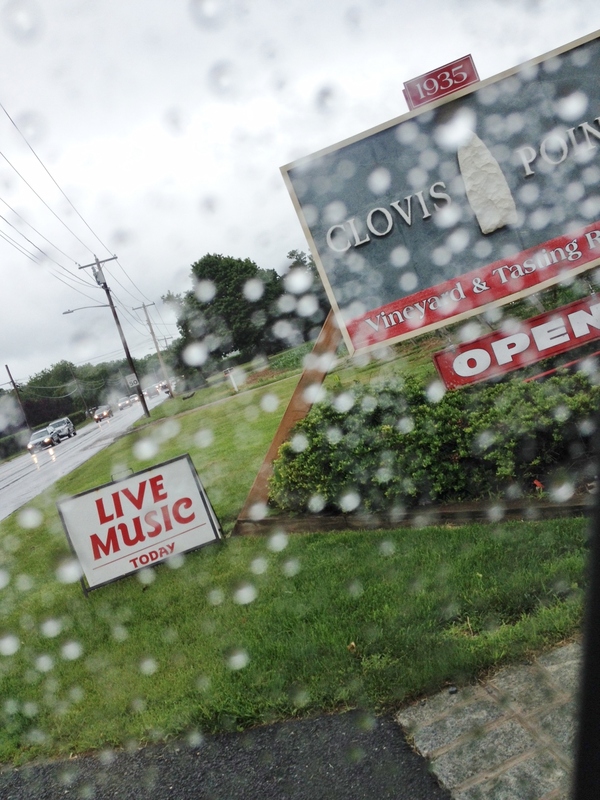 Clovis Point describes itself as a “boutique” winery, and a sign outside forbids all limos. Pretty flowers line the pathway to the door. 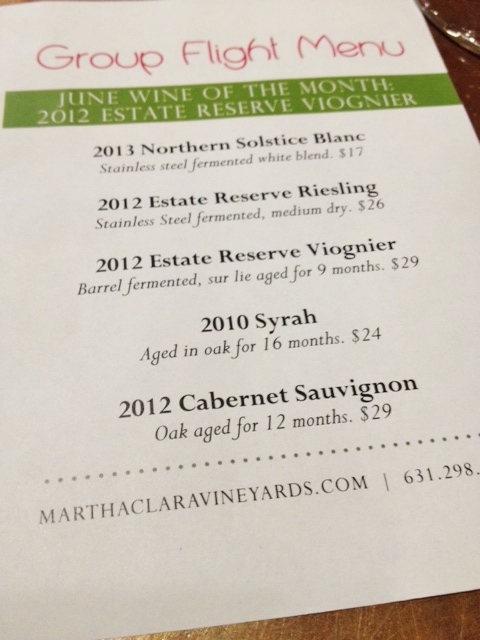 The menu features five wines for $13 or the three whites for $7 and the two reds for $5. We opted to share one tasting of all five wines, not actually a bargain! 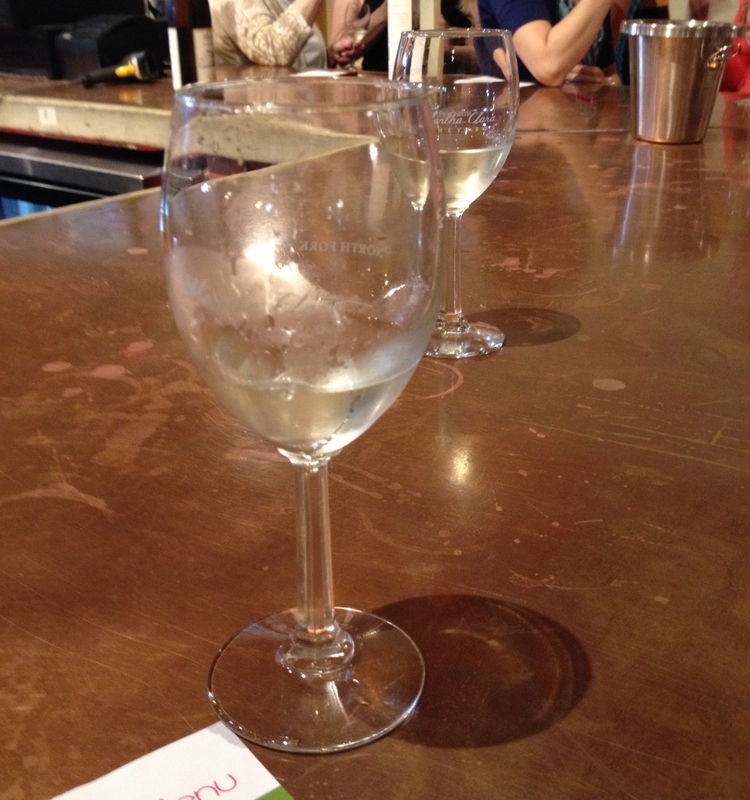 Due to the tiny pour, we had to be quite judicious in our sharing. I found the small pour interesting in that the servers rinsed our glass with a bit of the wine we were about to taste each time, a nice touch but it seemed a shame to pour out almost as much as we tasted. Through the window you can glimpse the porch where the music listeners are sitting. Although it is called chardonnay, this is also 3% gewürztraminer, which we felt contributed a slightly funky note to what is otherwise a fairly typical clean, crisp, lemony steel chard. It was fine, but we felt would be better with food. We’ve not yet tasted the wine. 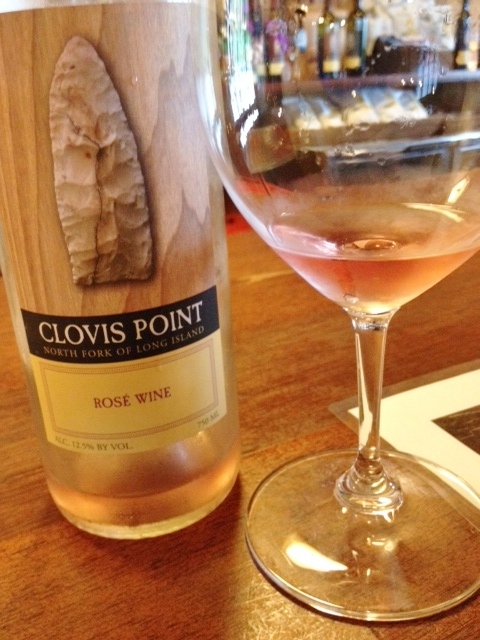 In general, we compare all rosés to Croteaux, and find them wanting, but we quite liked this one. It spends three days on the skins, and so has a deeper red and more intense flavor than many rosés. 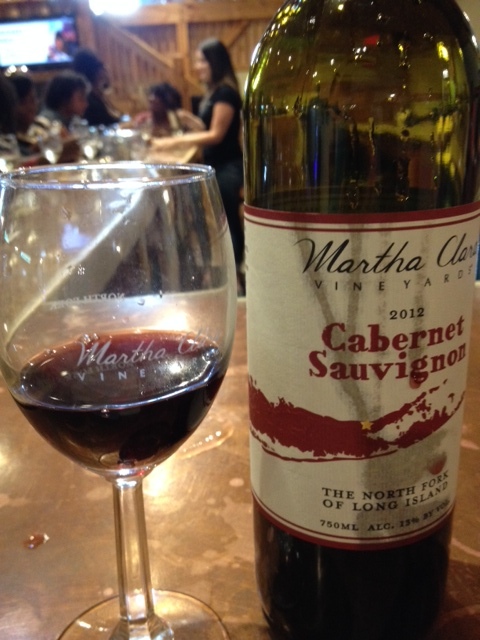 This is made from 97% cabernet franc and 3% merlot. The aroma is typically strawberry and watermelon, with a nice minerality. The taste also recalls strawberry, and is a touch on the sweet side, but the minerality makes the sweetness work. After ten months in French oak, this wine smells like vanilla and Werther’s candies, but is happily not as sweet as the smell would indicate. 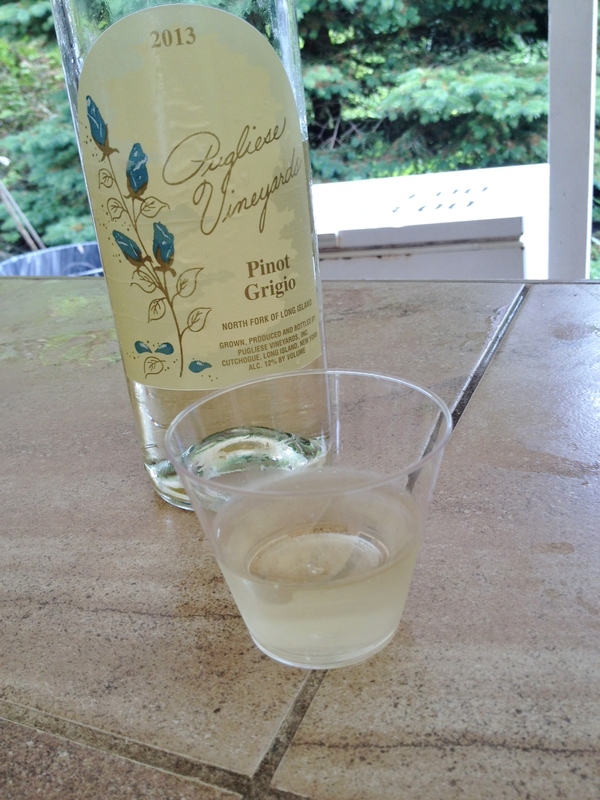 A hint of lemon juice makes this a sippable wine, not as oaky as a California chard. My tasting pal opines that this is not a challenge to drink. 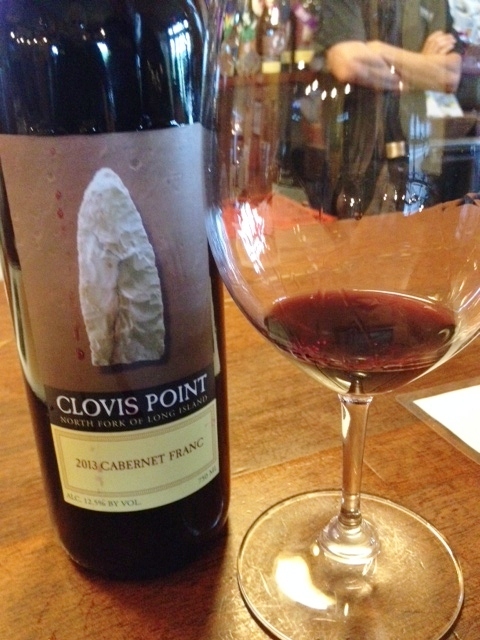 A blend of 94% cabernet franc, 3% cabernet sauvignon, and 3% merlot, this wine has a somewhat smoky, almost coffee aroma. The taste has some smokiness to it too, but not obnoxiously so. Though it is dry and brambly, we think it might do better with more age. A Right Bank Bordeaux-style wine, this is a blend of 86% merlot, 7% cabernet sauvignon, 4.5 % cabernet franc, and 3% malbec, says the menu. If you can add, you’ll note that that adds up to 100.5—and actually, the menu lists the percentage of cab franc as 45%! Oops. I’m a liberal arts major, says our server as an excuse, and promises to fix the menu right away. Regardless, this is also a wine that may need more time, as we find it a bit on the thin side, with lots of tannins and some blackberry taste. It might do well with a cheese platter, however. 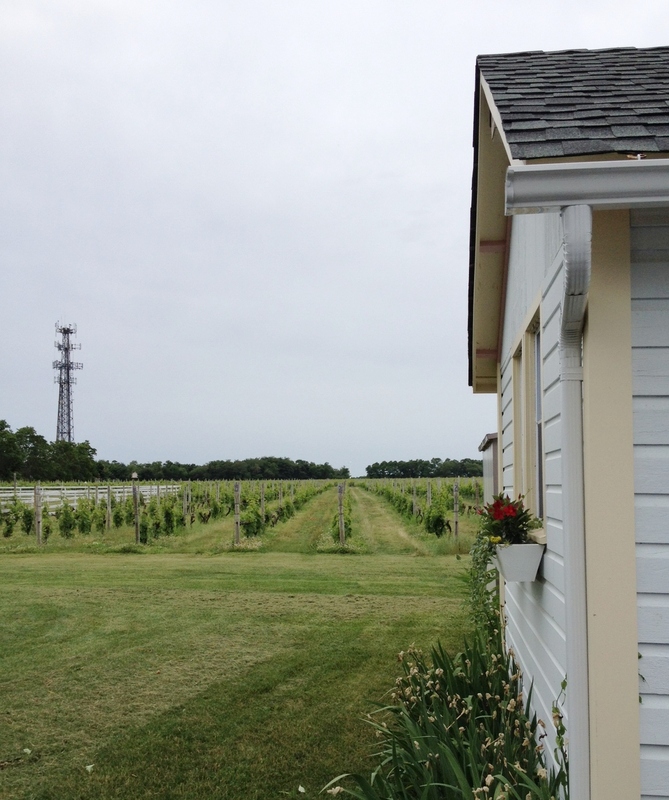 Reasons to visit: a nice place to listen to music; the rosé; the 2013 Barrel Chardonnay if you like oaked chards; pleasant quiet tasting room. 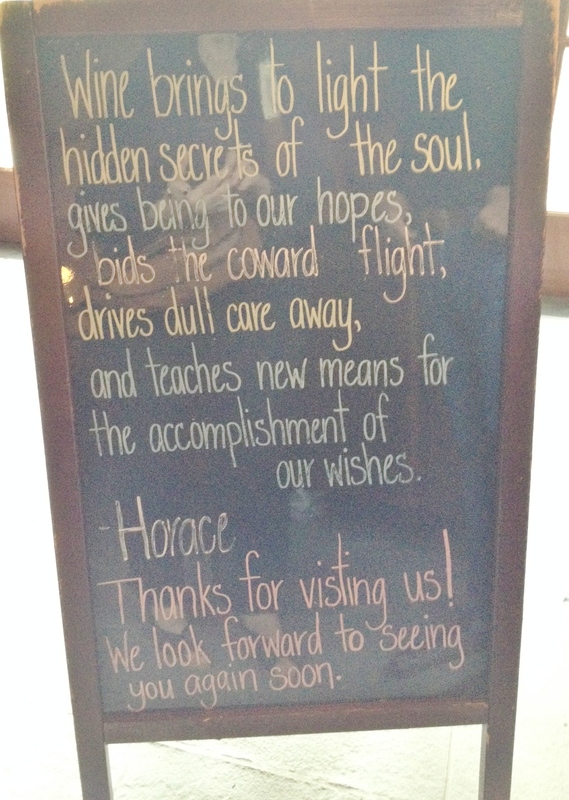 How cool to quote Horace! Our limo at the first stop: Martha Clara. 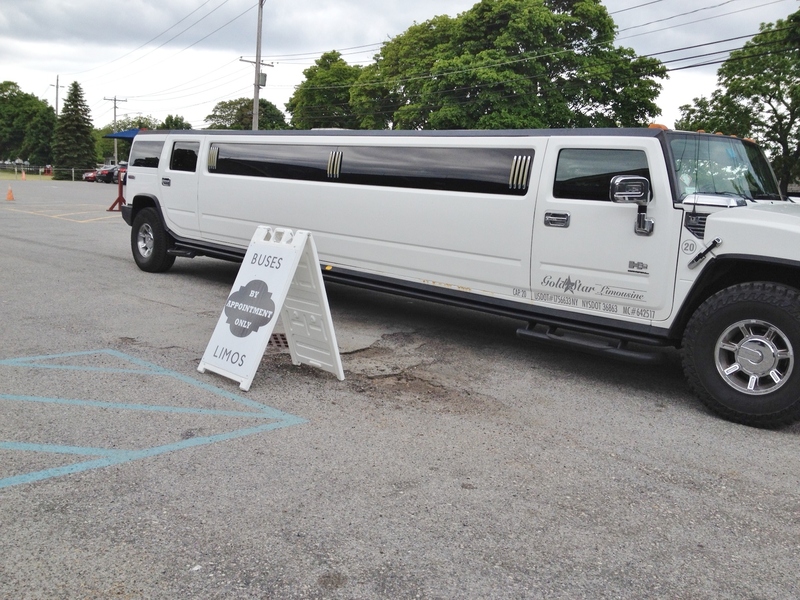 When a group of Nofo Wineaux’s friends and colleagues decided that the best way to have a celebratory get-together was to rent a limo and do a wine tour, she could not refuse to go along—especially since they asked her for some winery recommendations. So that is how I found myself seated in a Hummer stretch limo with 14 wonderful women, traveling the North Fork wine country. And I did enjoy myself! 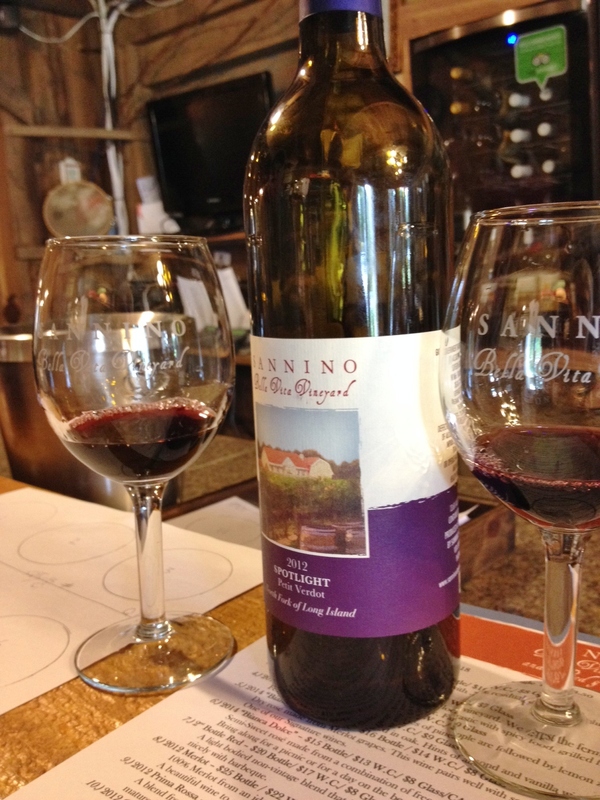 Along the way, I noticed that each winery had its own method of handling a crowd, I taught some of my friends how to smell wine (stick your nose into the glass and open your mouth as you inhale), and I heard some new ways to describe wine tastes and smells. Our limo was rented from Gold Star Limo Company, and John, the driver, was courteous and efficient, dropping us off and picking us up on schedule. The company took care of the logistics of reserving each winery and getting us sandwich and salad lunches catered by Farm Country Kitchen. There were a few reasons why I think our tasting tour went well. For one, as a group we were there to relax and enjoy each other’s company, with the wine tour as a means to that end, plus a number of us were quite interested in tasting and discussing the wines. Another reason was our judicious (if I do say so myself) selection of venues, and the fact that we limited ourselves to three places, spaced out from noon to five p.m. And finally, the weather cooperated—warm enough to sit outside, yet not so hot that we were uncomfortable. Our group organizer picked Martha Clara as a place she had been to and liked in the past, and it made a pleasant first stop (we got there about 12:15). 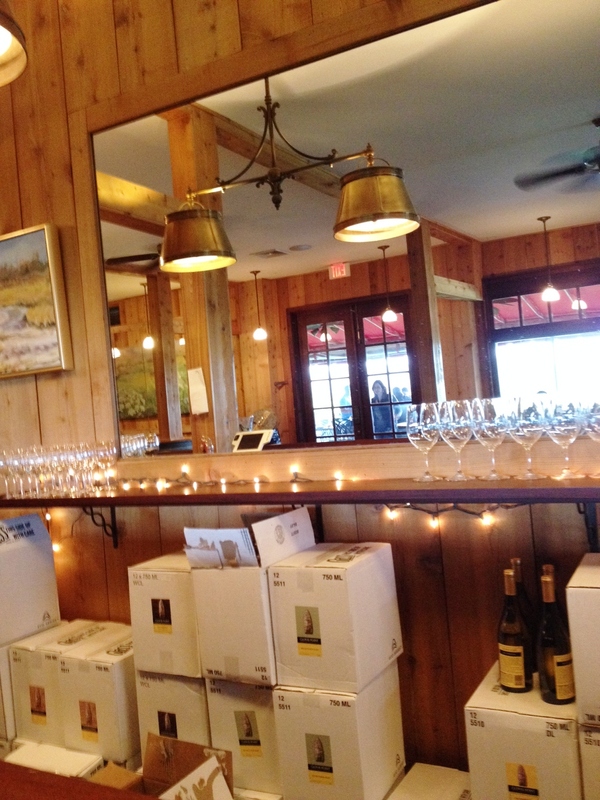 A young woman with a clipboard greeted us, checked our reservation and, after a brief consultation with the driver, set us up around two sides of one of the long bars in the tasting room. She explained that they ran a tight schedule of groups, and requested that we take our places immediately. At each place were a glass and the tasting menu, featuring a flight of five wines. The servers assigned to us attentively filled our glasses as soon as they were emptied, and gave a brief spiel about each one. When I requested additional information, they were able to provide some. After we finished, we wandered outside to some picnic tables and shared a few snacks we had brought with us while some members of the group explored the pens of animals one can pet and feed. 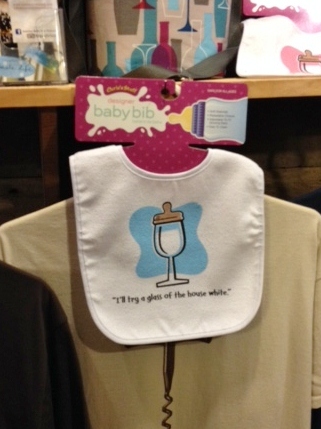 I think a few might have visited the extensive gift shop. We gathered around the bar at Martha Clara. 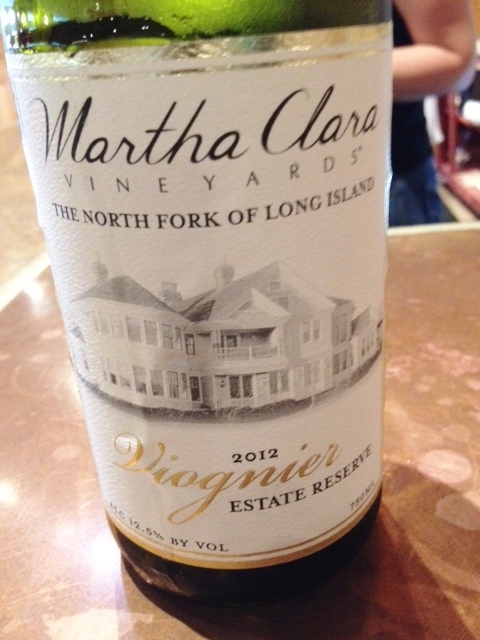 This is a blend, as the title suggests, of four whites: semillon, viognier, chardonnay, and sauvignon blanc. I described the aroma as mineral. 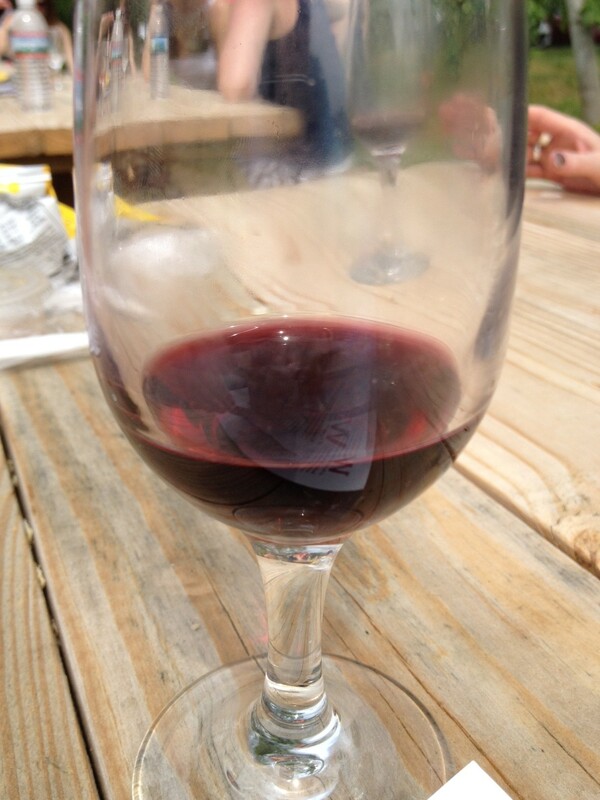 One of my friends, newly introduced to the art of smelling wine, compared it to the smell you get when you open a bottle of vitamins, which I thought was quite right. This is a dry, crisp, lean, steel-fermented white which we all found quite pleasant. My friend with the newly enlightened nose senses a touch of rotting fruit. I agree, but also add orange blossoms. We all sip, and I note some apricot tastes, and also a bit more sweetness than I prefer. Nice finish. We had been discussing why some people think they dislike chardonnay because all they have ever tried were oak-fermented California chards when this barrel-fermented (nine months) wine was served, giving me the chance to note how different it is compared to the steel fermented blend we started with. You can definitely smell vanilla and also spice—perhaps cardamom. You can also get that “woody” taste you get with some oaked whites. I often like syrahs for their rich fruit flavors, but I find this one a bit dry and thin. I also smell some of that barnyard scent North Fork reds sometimes get (though more rarely lately). It is aged 16 months in French oak. This red is also aged in oak, for 12 months, and I also am not enamored of it. It’s not bad, but could use more fruit, though it is nicely dry. The entrance to Lieb, though we didn’t go inside. 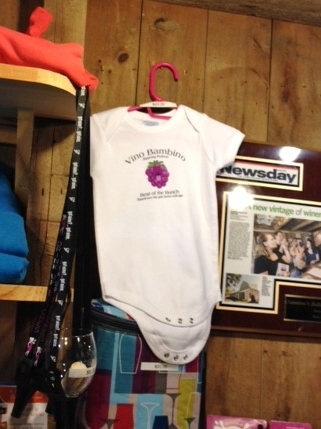 Lieb actually has two tasting rooms, and we are at the one on Sound Avenue and Cox Neck Lane. 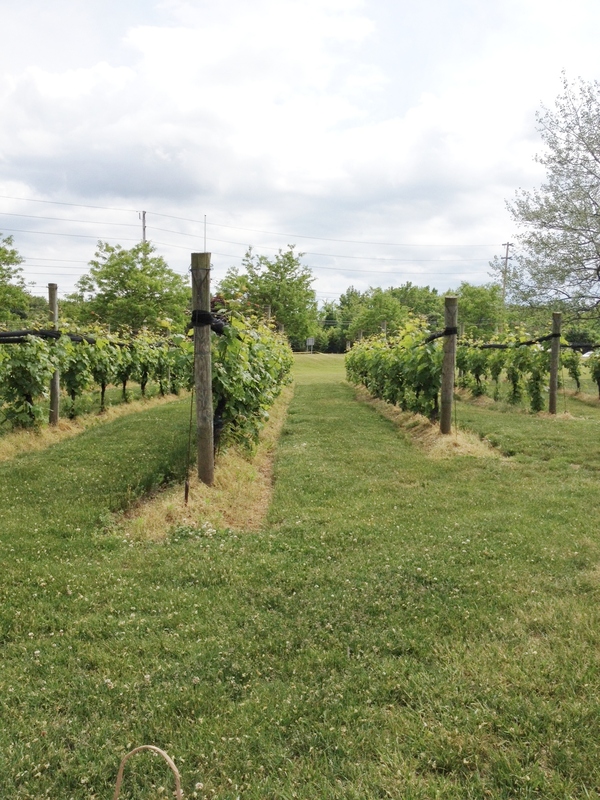 I’m a bit surprised that we have come to this one, since the other is more spacious, but fortunately it is a beautiful day and we settle ourselves at several picnic tables adjoining some grape vines. The driver brings us the shopping bags filled with our lunches from Farm Country Kitchen and also offers us bottles of water from the limo. As we settle in with our choices—I got a grilled veggie sandwich with a small green salad on the side, and it was good—a lovely young lady from the tasting room comes around with glasses. Ah, we are to have the tasting as we eat our lunches. 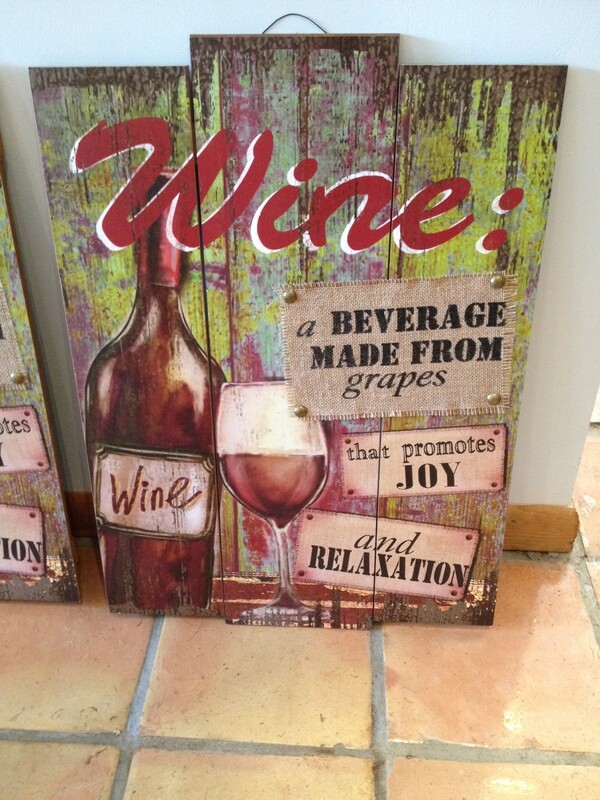 Nice—though I do note that food changes the taste of wine. Our view as we sipped our wine and ate lunch. What is also pleasant is that we have the place mostly to ourselves, and it is a relaxing venue to sit and chat and enjoy our lunches. Martha Clara had been quite noisy, making conversation difficult except with the person next to one. All the wines are from the Bridge Lane label, so I will abbreviate it BL. Also, because I did not see a tasting menu, I can’t tell you what the cost of these wines is per bottle. As our server explains, this is a white wine made from a red wine grape, and it is totally clear, having spent no time on the skins. It has a nice mineral aroma and a pleasant fruitiness. It would compare favorably with Anthony Nappa’s Anomaly. This blend included chardonnay, pinot blanc, riesling and viognier, and, like the blend we just had at Martha Clara, is steel fermented. Everyone agrees that we like this one very much, with its nice balance of sweet and dry and its mineral aroma and taste. It goes well with lunch! For those who think they dislike chards, this is a good rebuttal: dry and tart, with lemon and grapefruit tastes and aromas. Steel fermented, of course. After some discussion of how much rosés have improved in recent years, we try this blend of merlot and cabernet franc. Though I still maintain that Croteaux has the best rosés on the North Fork, this one is fine—slight strawberry aroma, very dry, but with no finish. I think it tastes a bit like unripe strawberries. I explain to my friends that this is a Bordeaux blend: 70% merlot, 15% each malbec and cabernet sauvignon, 7% petit verdot. It is aged in neutral oak barrels, our server notes. I think it might improve with more age, since it has some nice tannins. Though it is not exciting, it is a very drinkable red. 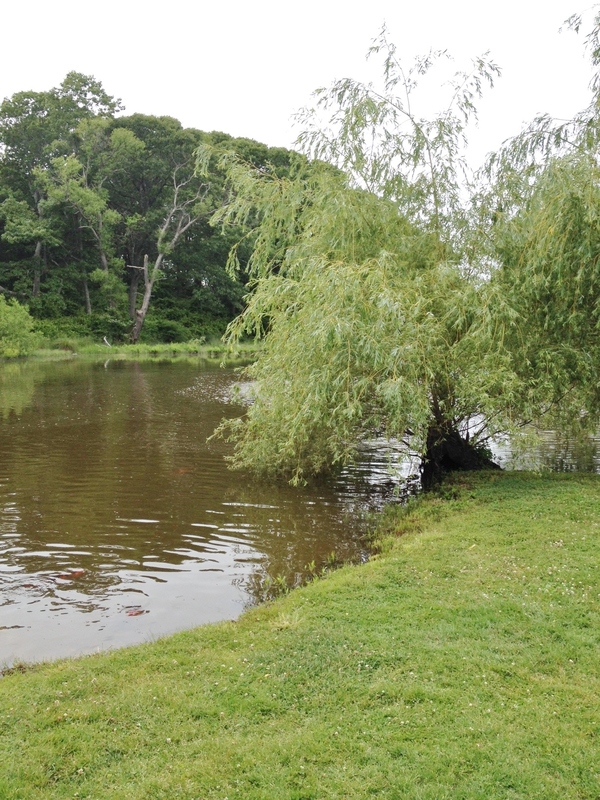 Everyone exclaims at the lovely scenery as we pull into Pugliese—the pond, the trees, the fountain. Charming. 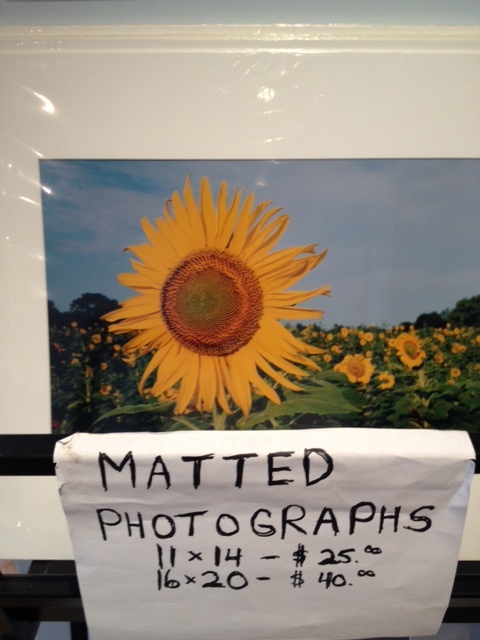 We troop into the tasting room, where we admire some artistic items, including pretty prints appropriate to our surroundings, such as sunflowers. 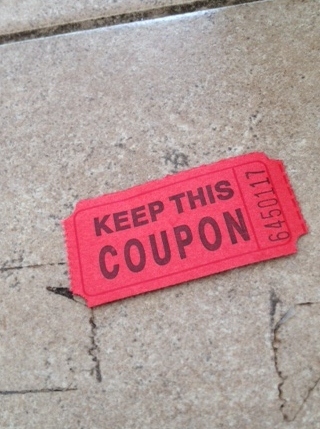 Our fearless leader soon finds us and hands each of us a sheet of four tickets, which we can exchange for tastes, and tells us to adjourn to the outside bar located under a tent next to the pond, where a musician is setting up. As a result, we scatter, and form into small groups at the bar. The menu is quite daunting, offering 22 choices from sparkling wines to dessert wines, with reds, whites and rosés in between. At first the servers offer no guidance other than, “You can choose any four.” (We expand our options by sharing a couple of tastes, which is why you see six wines mentioned here.) However, we then luck into a rather youthful server who seems to know more, and enjoys giving us information about each wine. My good friend is a white wine drinker who would like to learn to like reds, so we decide, after one white, to focus on the reds. For each taste we get a fresh glass—I mean small plastic cup. 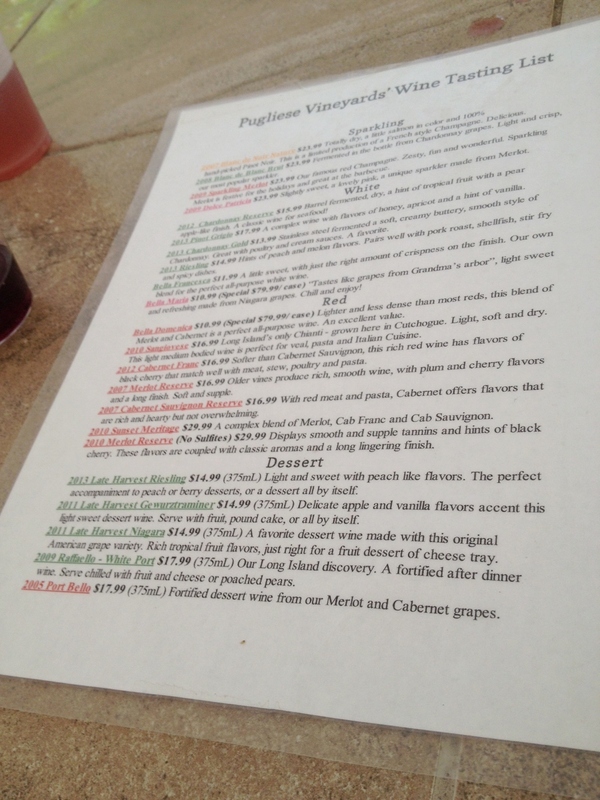 The rather lengthy menu at Pugliese. This steel fermented pinot has not much aroma and a tart lemony taste, with no finish, which my friend insists on calling after taste. Which, after all, is what finish is! It would be better with food, I think. Pugliese serves the wine is small plastic cups. 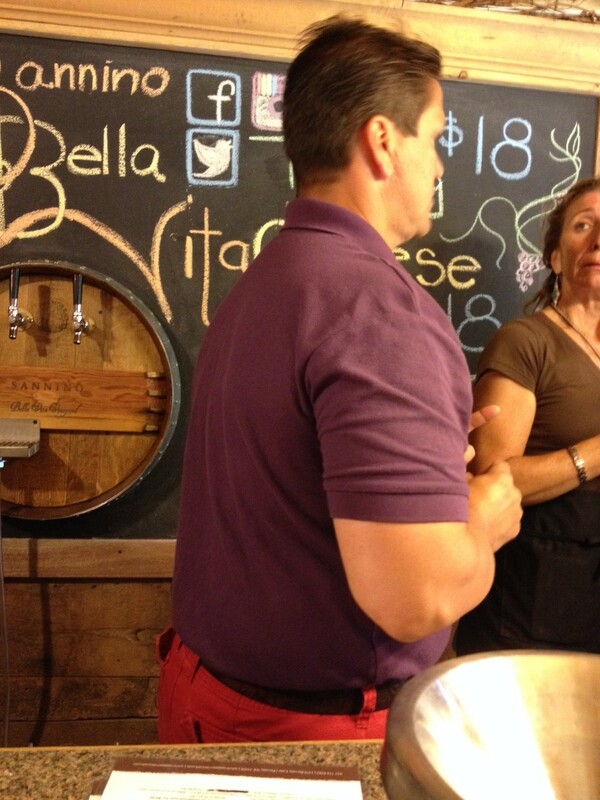 Our server boasts that they are the only winery on the North Fork to use this grape, which is the gape used in Chianti. As we sniff, we note aromas of tobacco and some fruit. Then we taste, and promptly dump. Well, this wine is not going to make a red wine drinker out of my friend! Bad. Whew. This one is better! A blend of merlot, cabernet franc, and cabernet sauvignon, this has nice ripe fruit flavors and is just tannic enough to add interest. One view of the tent and the pergola. This would make a good, everyday table wine. It has lots of fruit and my friend likes it. For a cab franc this is quite light, though it would be okay with lamb chops, as it has some tannins. It could use more fruit. 2007 Raffaello White Port $17.99 for 375 ml. As my final wine of the day, I decide to go for dessert, and try their white port. Yes, it is sweet, but I think appropriately so, with lots of sweet orange, tangelo, plum, and apple flavors. At 20% alcohol, you wouldn’t want to drink much of this, but it would be nice with a cheese and nut course. 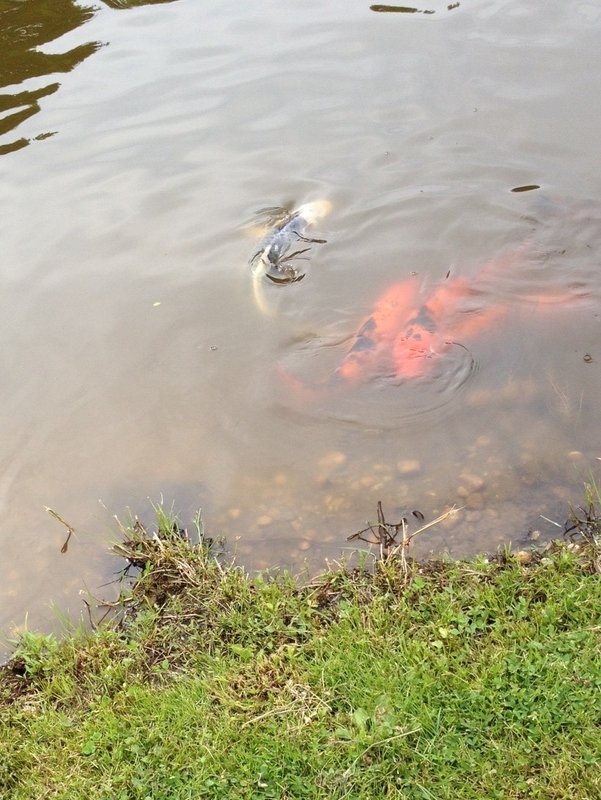 And so I finish my foray into the world of the limos standing on the shore of Pugliese’s pond, admiring the koi, listening to music, talking to my friends, and sipping sweet wine. There are worse ways to spend a Saturday. Suggestions for limo users: plan to go to just three wineries (maybe four at most, especially if you tend to dump part of each taste) and space them out over five hours so you can appreciate each one; try to go to at least one that doesn’t seem to specialize in big groups (like Lieb, which we thoroughly enjoyed); be sure to eat in between—or during—your tastes so you don’t get too drunk; take your time in each place to savor and discuss the wines; have fun.